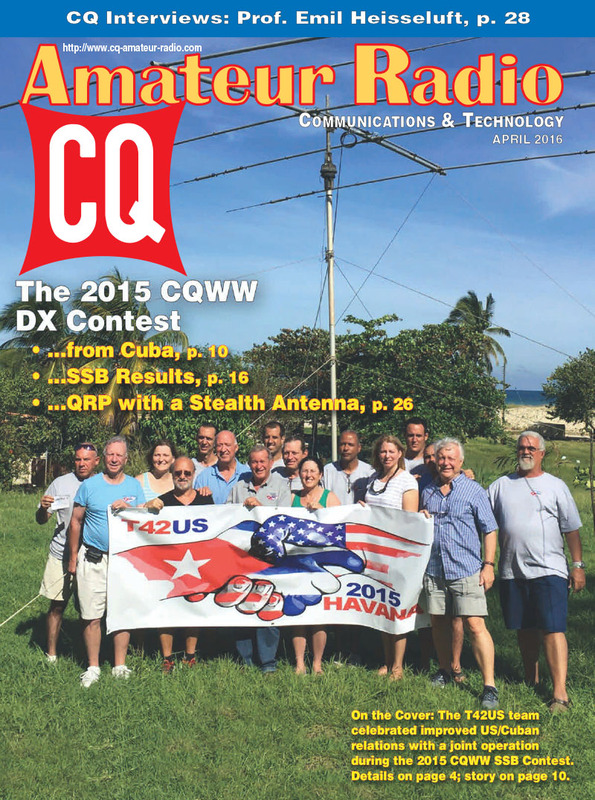 The experience of operating in a major ham radio contest can be as important as your score (maybe moreso), and we cover both sides of that coin in the April issue of CQ. 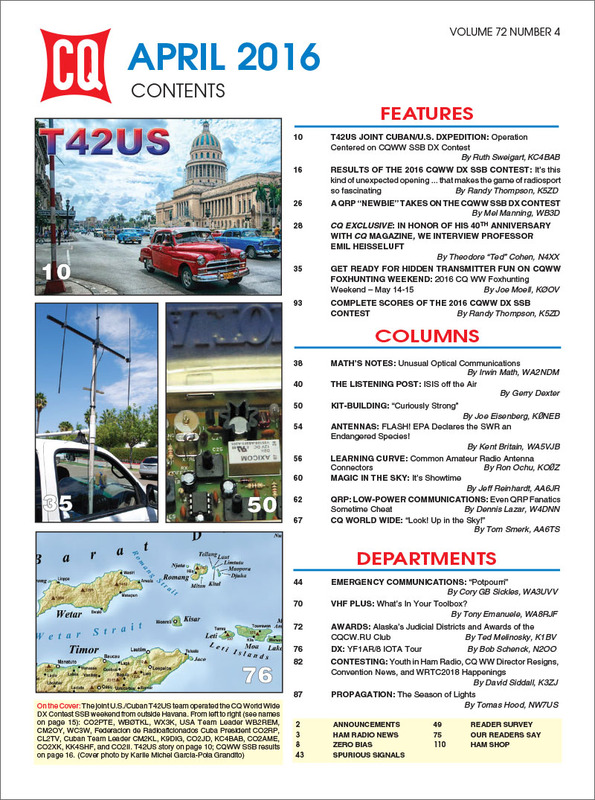 T42US was a special joint operation by U.S. and Cuban hams during the CQ World Wide DX Contest's SSB weekend last October, celebrating the improved relationship between our respective governments. Still, operating in Cuba was a bit of culture shock for the U.S. team members, as explained by Ruth Sweigart, KC4BAB, in our cover story. At the other end of the station complexity scale was Mel Manning, WB3D, who used a YouKits handheld HF transceiver with 5 watts to a stealth wire antenna to see if he'd be able to make any contacts at all … and won top honors for his category in North America. His story follows the full results article, which once again includes complete score listings in the magazine. Foxhunting, or hidden-transmitter hunting, is an entirely different kind of ham radio competition. The annual CQ World Wide Foxhunting Weekend takes place in May and moderator Joe Moell, K0OV, offers a preview of what to expect, along with ideas on different kinds of hidden transmitter hunts your group can try. And, if it's April, then it must be time for our annual visit from Professor Emil Heisseluft … but with a twist this year. It's been 40 years since the professor's first article in CQ, and in honor of that anniversary, we persuaded him to sit down for an interview with Ted Cohen, N4XX, who did a whole series of CQ Interviews… back in the 1970s and '80s. We've also got our usual collection of great columns, with topics ranging from the use of Altoids® tins in ham radio kit-building to the effects on propagation of aurora in the upper atmosphere. All this and more … in the April issue of CQ, in readers' mailboxes by early April and online for digital subscribers on or about April 1. 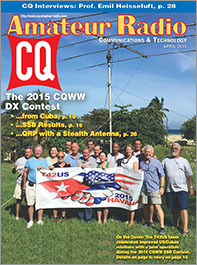 Zero Bias –"Meeting New Hams Where They Are"
On the Cover: A joint team of U.S. and Cuban amateurs put T42US on the air for the SSB weekend of the 2015 CQ World Wide DX Contest. 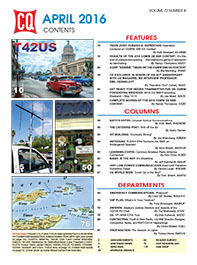 Their story, as well as complete contest results, are in this issue.